It might have an R1 engine, frame, suspension and the superbike's beady twin LED headlights, but Yamaha are at pains to tell us, here at its world launch today, that the new £9999 MT-10 isn’t a naked R1. After a day in the saddle it’s clear they’re right. On the road it’s not a naked R1 - it’s so much better than that. Excited? You should be. The R1 is all about the racetrack and it’s so capable it gives you little sense of speed, or indeed fun, when it’s not being ridden flat out – which of course you can’t do on the road. And after a couple of hours in the superbike’s hard race seat, it’s uncomfortable, too. Enter the MT-10. With its upright riding position, business class levels of legroom and decent wind protection at motorway speeds, the new Yamaha super naked lets you enjoy that gem of a crossplane crank motor at saner speeds. It’s a masterpiece of an engine. It growls like a MotoGP bike at full whack, has the punch of a V4 out of corners and a power delivery so elastic, an electric motor would seem clunky by comparison. The throttle response is peachy, too, so long as you leave it in ‘standard mode’. 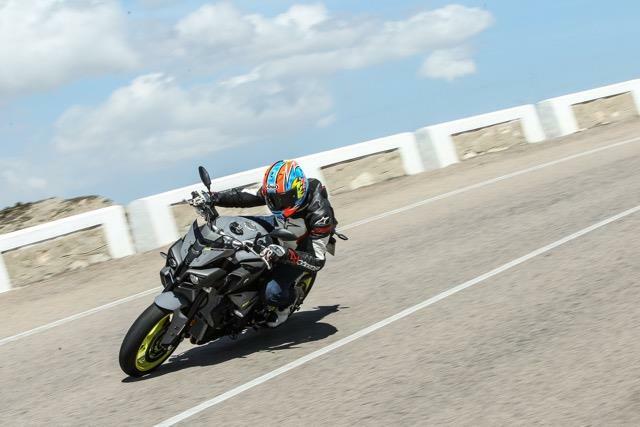 A and B modes are too sharp for accurate cornering…or wheelies. Who said Euro 4 had to be boring? But third is the magic gear on the MT-10. Just leave it there through your favourite set of bends and the engine is so flexible it will take you from 20mph to over 100mph. It lets you ride the MT-10 like a demented twist and go moped. 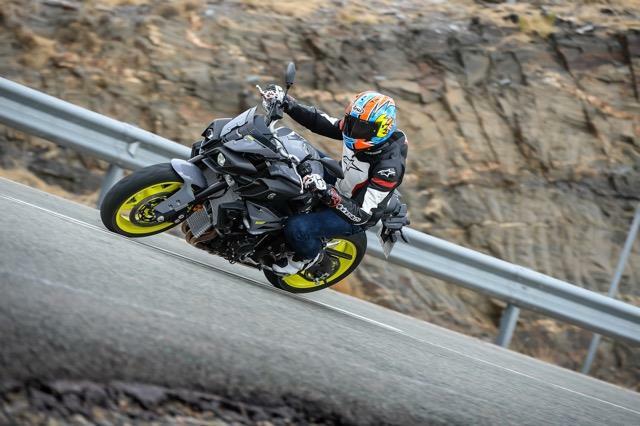 The MT-10 is all about its stunning engine and performance and will easily match the best of the super naked competiton, but the chassis, suspension set-up and old-generation Bridgestone S20 tyres are slightly less racy. That said, the Yamaha is still hugely competent, stable, grippy and forgiving no matter hard you push on and it's pleasant to ride at nornal speeds. 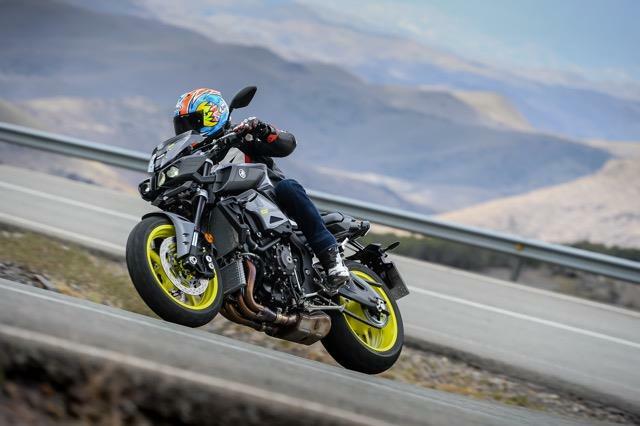 Top European super nakeds, like the KTM 1290 Super Duke, Aprilia Tuono V4 1100, BMW S1000R and Ducati Monster 1200R all have sharper steering and handling, but it wouldn’t take much to sharpen-up the MT-10 with a few suspension twiddles, sportier tyres and fitting Yamaha's accessory quickshifter. What’s most impressive is the Yamaha's price tag – less than ten grand. For that you get that jewel-like engine, traction control, ABS and even cruise control, which is a nod to the MT-10’s more practical side. The Yamaha might love wheelying out of third gear corners off the clutch, but it’s just as happy on the long haul and if you bought the official Yamaha screen and some panniers you’d have built yourself an practical MT-10 Tracer, in all but name. I rode an MT-10 today with these extras fitted, and more, and it morphed into a svelte sports tourer, along the lines of a Kawasaki Z1000SX. But here in its naked form the MT-10 is hugely impressive. Yamaha hasn’t dumbed down its R1’s track genes - just tweaked them to suit real world riding. It should have the performance to stay with the top European super nakeds and it's so much more refined, involving and exciting than the Japanese competition. MT-10s arrive in dealers at the beginning of June and there are test rides available in the upcoming MCN Festival on 14/15 May. Check out the full test in MCN on Wednesday and a video review soon. Powered by the current R1 engine, Yamaha has calmed the superbike’s peaky delivery and added grunt. The MT-10 has 40% new parts, including lightweight pistons, new intake ports and 2mm smaller valves, revised combustion chamber shape, two-litre bigger airbox, exhaust system, single injectors instead of two and a new light action slipper clutch. Inertial crank mass up 40%. Compression ratio down to 12:1 from 13:1 and there’s an extra two teeth on the rear sprocket for shorter gearing (T43). Peak power (158bhp@11,500rpm) is made 2000rpm lower than the R1 and torque (82ftlb@9000rpm) 2500rpm further down the rev range. It might not have the full package of electronics you’ll find on the R1, but the five grand cheaper, is still ride-by-wire controlled and offers all the electronic assistance you’ll need on the road, including three-stage traction control (which you can also switch off), three riding modes and ABS. BMW’s S1000R is the only other sports naked to come with cruise control, but with the MT-10 it’s included in the price. The system works 4th, 5th and 6th gear between 30mph and 110mph. Cruise control is handy for keeping your speed down on open roads and for making long journeys less tiring. 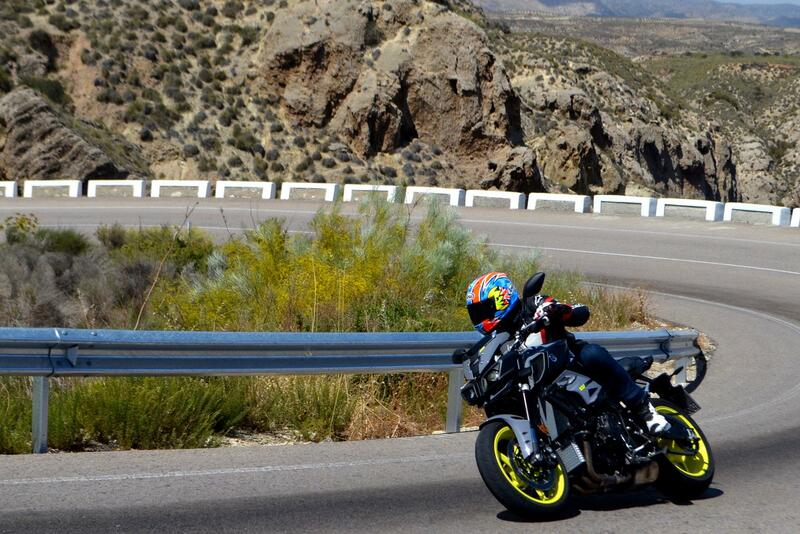 In true streetfighter style the MT-10 is a superbike with straight bars and no fairing. It has twin LED headlights taken from the R1, a slimmer, MT-09-style back end and lots of aggressive, insect-like bodywork panels. The big naked has wide, tapered bars and an upright riding position that Yamaha claims is slightly more ‘over the front’ aggressive than their three-cylinder MT-09. Yamaha has played with the R1’s cast ali frame to give it more flex for extra feel and comfort on the road. 60% of the chassis is changed from the R1. The wheelbase measures 1400mm, which is the shortest of all the super nakeds and the same as the MT-07. The MT-10 also has a new steel subframe, which will take pannier brackets, fully-adjustable KYB forks and shock from the R1, five-spoke cast ali wheels and twin discs with four-piston radial calipers and new Bosh HU ABS. A new LCD multifunction dash isn’t as bling as the R1’s full colour display, but it features everything you need, including a gear position indicator, fuel gauge, outside temperature, clock and all the usual information and warning displays. Grey (with fluoro yellow wheels), blue, black.